I found the perfect solution to finding out how fast I’m going in my roadster without hooking a speedo-cable into the transmission. I mean, I wish I could, but the speedo input is right next to the frame. I’d have to do some major surgery to make it work. No worries with the GPS setup… and it’ll be more accurate, even if I change tire size some time in the future… read on! Monitor speed accurately, on or off road with satellite signal technology from Auto Meter! 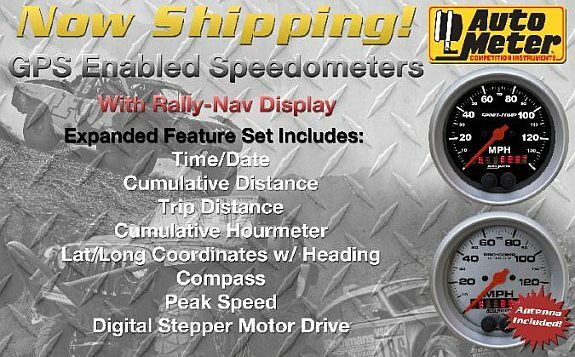 New GPS Rally-Nav speedometers are engineered to interpret data from an included high speed antenna assembly providing lightning quick response and eliminating the need to ever calibrate the instrument for gearing and tire size changes. In fact there’s no reason to interact with the transmission or driven wheels at all, resulting in a simplified installation. Built in the USA utilizing race proven, rugged and precise digital stepper motor drives for smooth pointer readings and heightened resistance to shock and vibration. Rally-Nav red LED digital display includes standards like odometer and trip, in addition to providing useful satellite signal information such as Compass, Heading, and Coordinates for navigation, an Hourmeter for tracking vehicle maintenance, GPS Date and Time, and Peak Speed Recall for tracking a sector best, corner entry speed, or perhaps just for the next time your teen or buddy borrow the keys. Available now with 140 MPH scales in popular Ultra-Lite, Sport-Comp, and Phantom designs in 3 3/8″ and 5″ sizes suitable for use in applications ranging from buggies and pre-runners to hot rods and muscle machines. Prices starting at $350.